The Westbrook House has a very efficient passive solar, well-insulated, and tighly sealed shell. This dramatically reduces the amount of energy needed by the house. The mechancial systems inside the home efficiently produce the cooling, heating, and hot water that is needed. The solar photovoltaic (PV) system produces most of the electricity needed to power the home. See the Utility Data for the results. Also known as a Geothermal Heat Pump. 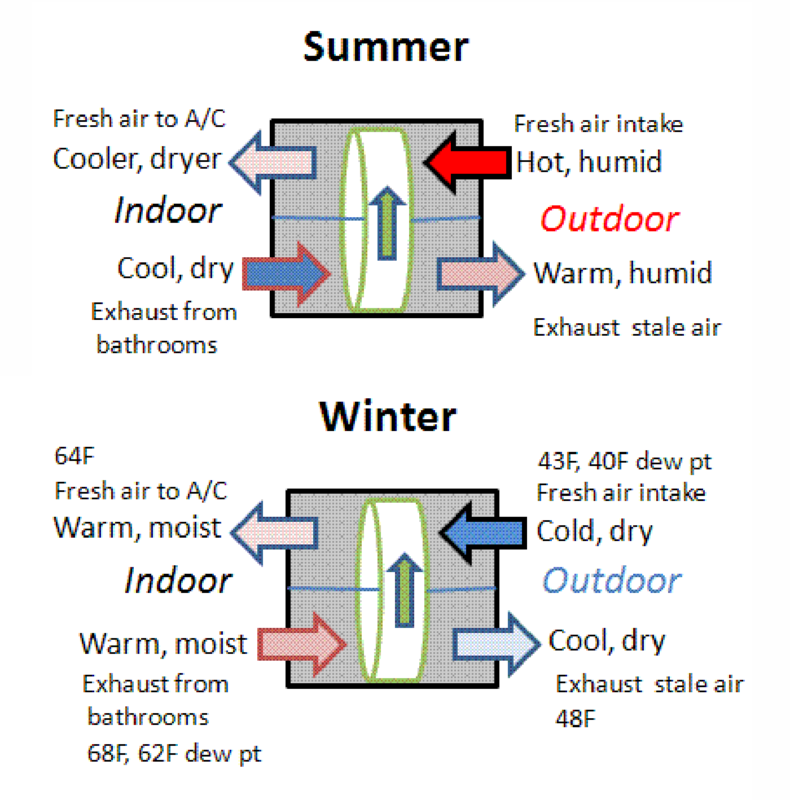 Standard heat pumps rely on outside air as a heat sink or source. 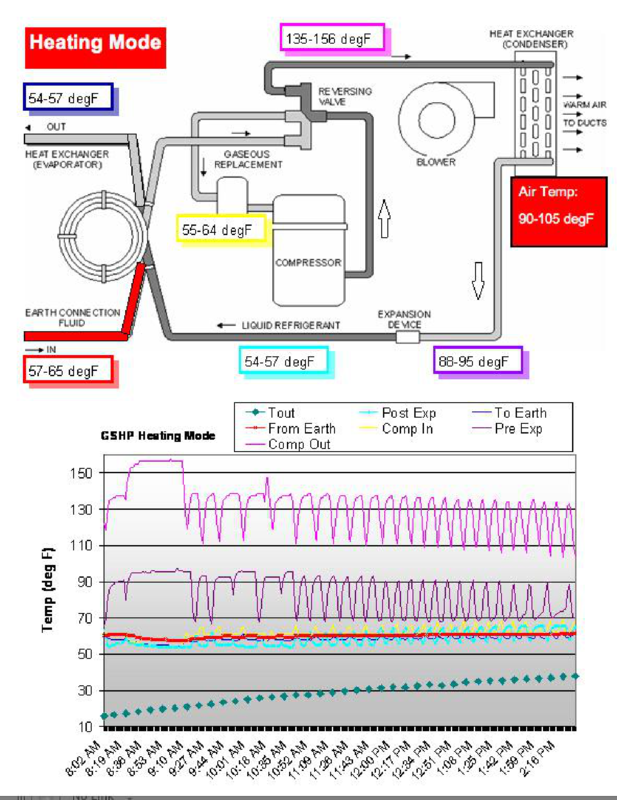 A ground source heat pump uses the stable temperature of the earth as the source or sink. This allows them to operate much more efficiently. Our system has one 220' shaft per ton of capacity. In the summer, the condenser is rejecting heat to the 70 deg F earth instead of the 100+ deg F air. In the winter the unit draws heat from the 70 deg F earth instead of the cold outdoor air. In the winter, the warm water is pulled from the earth then passed thorugh the compressor where it is warmed enough to reject heat into the house. The data on the graphic shows the unit in heating mode. Our unit is a 2-speed system to better match the variable load. In runs most of the time in low speed mode which allows it to better dehumidfy the air in the summer, which makes the house more comfortable. Running longer in low speed is more effective and efficient than running for shorter bursts in high speed. The first step is always to build a good shell - well insulated with minimal infiltration. The is will reduce the size of the heating and cooling system. Here's a link with more details and information. Homes that are tightly constructed can significantly reduce air infiltration and reduce the heating and cooling requirements. To keep a healthy supply of fresh air in a tight house a Heat Recovery Ventilator (HRV) or Energy Recovery Ventilator (ERV) is recommended. These systems allow you to have ample fresh air brought into the home in a controlled manner. Most homes get fresh air from leaks in their structure. Those leaks also allow dirt and pests into the house. The ERV air is filtered, so it results in a cleaner home. HRV's transfer sensible heat. ERV's transfer both sensible and latent (moisture) energy. Our ERV uses a rotating desiccant wheel to exchange temperature and moisture (or dryness) from the outgoing air to the incoming fresh air. Our unit recovers about 70% of the energy from the exhaust air stream The graphic showns the actual data on a cool day. .
We get enough sunshine to provide us with the vast majority of our hot water. 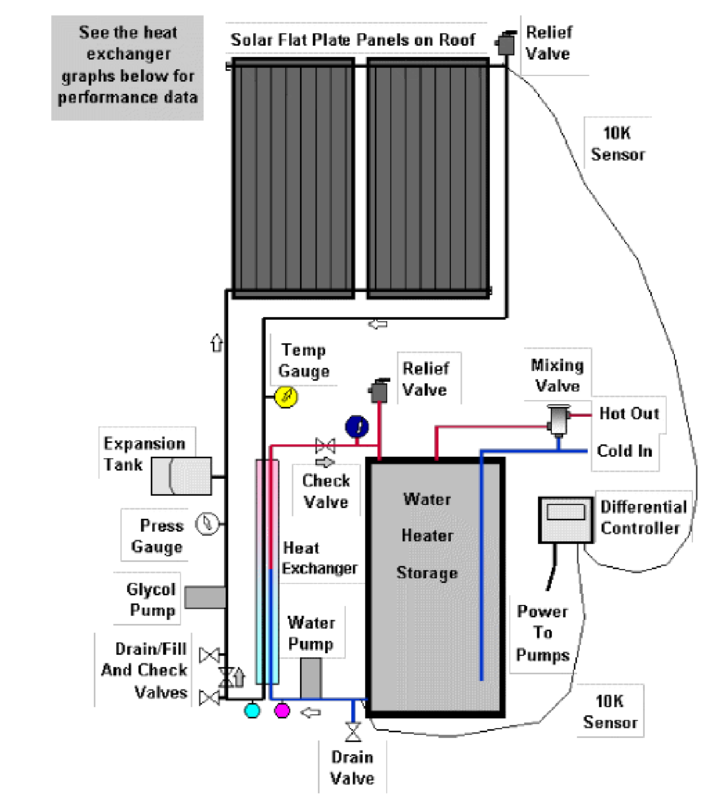 Our house utilizes a pair of flat plate collectors and a closed loop heat exchanger. A propylene glycol/water mix circulates in the loop to the collectors on the roof. It is heated by the sun to over 200 deg F. It returns, goes to the heat exchanger and heats the domestic water loop which comes from the bottom of the storage tank. Our 85 gallon storage tank can reach 160 deg F at the end of a sunny day. A mixing valve tempers the water before it reaches our fixtures.The tank has a nice R-25 jacket around it, which keeps the water hot for several days. A differential controller senses the temperature at the flat plate and at the bottom of the tank. When the flat plate is 6 degrees F warmer, the pumps turn on. When the temperatures are equal the pumps turn off.The pumps are small, fractional horsepower units that cost pennies per day to operate. We have an electric resistance backup element for prolonged cloudy periods. 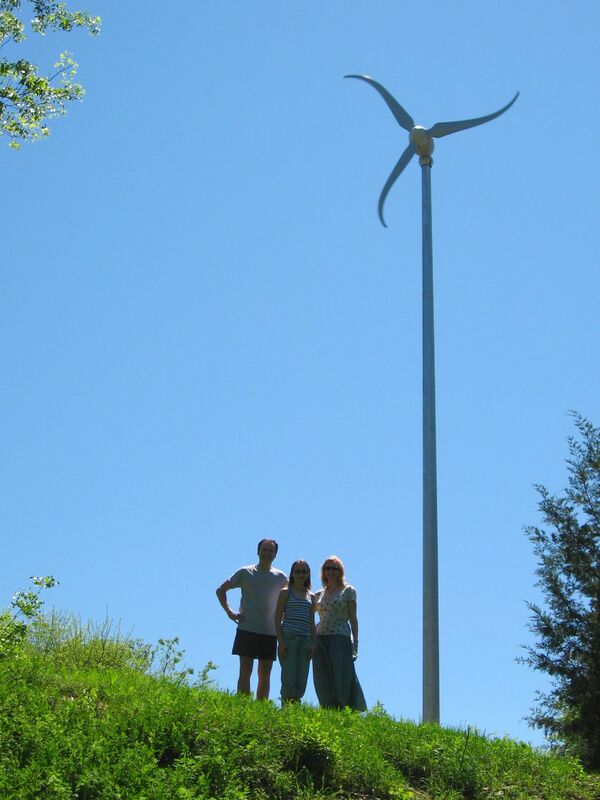 In 2006 we installed a Skystream 3.7 wind turbine manufactured by Southwest Windpower. The unit is rated at 2.4 kW peak. In our area the average annual wind speed is about 11 mph, which should produce about 250 kWh/month. Our unit had significantly reduced output due to adjacent tree turbulence. Our unit produced only about 20 kWh/month. The three most important items for a wind turbine - Location (strong wind area), Location (no obstructions), Location (tall tower). Informational flyer posted about our unit (pdf file). 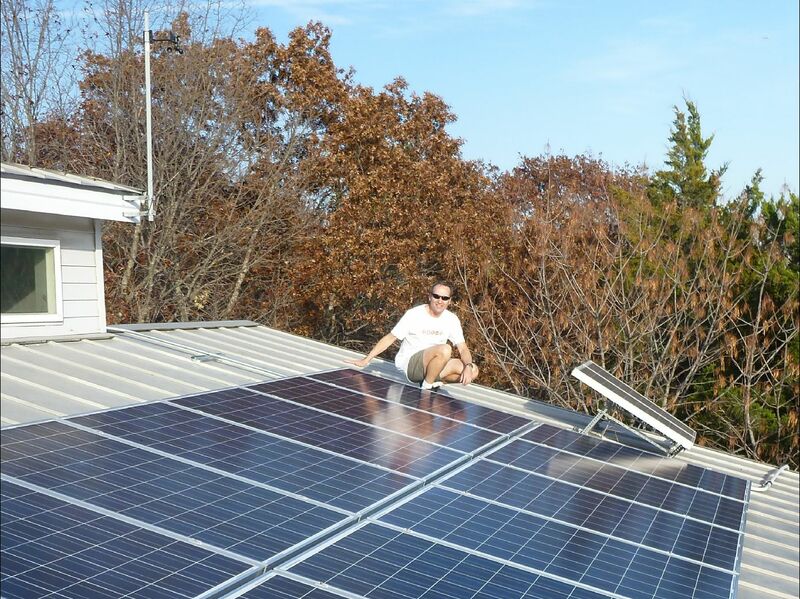 Note: We sold the Skystream in January of 2014 and added a few additional solar PV panels. Consulting Services for energy and resource efficiency.